Travellers booking a Deluxe Room at the Hotel Villas Playa Samara with Air Canada Vacations (ACV) will receive a free eat and stay for the first child aged 12 and under. Ideal for families, this all-inclusive beachfront property offers suites and one- and two-bedroom villas that can accommodate up to six guests. Two restaurants including buffet and à la carte options are also on site featuring international, Italian, seafood, Asian and Costa Rican cuisine. Villas Playa Samara also includes two bars, one large swimming pool, a games room, complimentary use of bicycles and a variety of activities and entertainment. 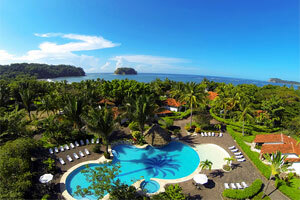 The resort also offers extra inclusions for honeymoon and wedding groups. Part of ACV’s Privileges program, guests staying at the resort will receive preferred room location, early check-in, late checkout, free Internet and three guaranteed à la carte dinners. The Liberia International Airport is approximately a two-hour drive from Hotel Villas Playa Samara. ACV offers weekly winter service into the destination out of Montreal and three times weekly winter service out of Toronto aboard Air Canada Rouge. Weekly service during the summer is also available out of Toronto.